Every autumn, millions of people head to Munich to celebrate that hoppy concoction that we all know as beer. 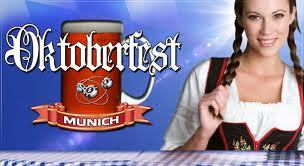 Oktoberfest, the grand German fete for the beverage made from fermented barley and yeast starts September 18. Online travel experts cheapflights.com offers a list of the top 10 things to do in Munich during Oktoberfest.